So are all physiotherapists in Canada CAMPT-Certified? Are FCAMPT physiotherapists only found in Canada? Where does the FCAMPT education come from? 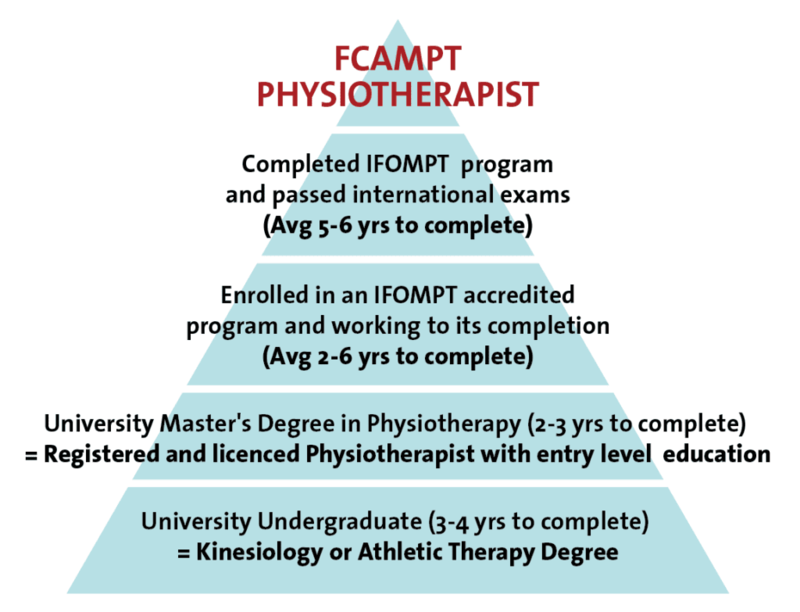 Why would a physiotherapist want to become CAMPT-Certified? What are joint manipulations techniques? Why choose joint manipulation as a therapy? I’m a physiotherapist, how do I become FCAMPT? What are the requirements to become CAMPT-Certified? Does CAMPT have a maternity leave policy? I am an educational institution that would like to become IFOMPT accredited, how do I do that? I would like to advertise a course or job through the CAMPT website. Who do I contact? FCAMPT stands for ‘Fellows of the Canadian Academy of Manipulative Physiotherapy’. In Canada, we recognize these physiotherapists through the designation of ‘FCAMPT’ or by the CAMPT-Certified logo featured on business cards, websites, clinic referral pads, and on signage within clinics. CAMPT-Certified physiotherapists have advanced training and clinical abilities in Orthopaedic assessment as well as manual (hands-on) therapeutic treatment techniques. Yes and no. FCAMPT is the Canadian version of this specific education designation. FCAMPT-type physiotherapists can be found in many countries around the world, however, each country will identify these therapists differently. FCAMPT education is hosted through several Canadian-based education committees and universities, however, the education taught is regulated by the International Federation of Orthopaedic Manipulative Therapists (IFOMPT). IFOMPT is the regulatory body for all countries who teach or have practicing FCAMPT-type physiotherapists. Joint manipulation is a unique, high level, regulated skill that can help to reduce pain and improve movement and function. More specifically, joint manipulation is the application of a rapid force movement that helps to create space (or gapping) of a joint. The gapping created helps to change the firing pattern of pain nerves, allowing a person to experience less pain. help you return to pain-free living faster. Techniques such as thrust manipulation have demonstrable benefits for reducing muscle pain and tension, and for restoring normal joint movement. FCAMPT therapists use scientific and clinical evidence and the biopsychosocial framework of each individual patient to guide the application of manipulation. FCAMPT is a trademarked and protected title, which shows you have completed post-graduation training in hands on therapy techniques that meet international standards. The CAMPT-Certified program is designed to raise awareness of this title and brings many benefits. Up to date with CAMPT registration fees. Orthopaedic Division of the CPA: The Diploma of Advanced Manual and Manipulative Physiotherapy. University of Western Ontario: The Master of Clinical Science in Manipulative Therapy degree. McMaster University: The Masters course-based option in the Rehabilitation Science Program. All members need to renew their membership even during a maternity leave. If a member is on maternity leave during the renewal period, this member can benefit from a 75% discount by selecting the maternity leave option. If a member does not renew, the seal will need to be returned to CAMPT at the member’s expenses. The following year, this member will have to pay a penalty fee of $100 in addition to the seal shipping fees. Please note that FCAMPT and CAMPT are trademarked and protected titles. If you fail to maintain your membership you may not promote yourself as FCAMPT as this is a registered trademark of CAMPT. The only way to gain IFOMPT accreditation in Canada, or for your graduates to apply for FCAMPT titling is to petition CAMPT. To review the petition and monitoring process, or to download the petitioner’s guide click here. Please contact our CAMPT secretary and they will help you get your course or job posting listed though our site.